(CNN) – The number of Americans who said gasoline prices are the most important economic problem facing the country has more than tripled since December, according to a new poll. The CNN/ORC International survey released Thursday, the same day President Barack Obama delivered a speech about gas prices, indicated oil companies received most of the blame for higher prices at the pump. Seven in ten Americans said rising prices have caused hardship for them and their families, with nearly half saying the prices will rise to five dollars a gallon some time this year. The current average price for a normal gallon of gas nationally stands at $3.921, according to the latest figures from AAA. Obama addressed gas prices during a speech ahead of a procedural Senate vote expected Thursday on a bill to repeal tax subsidies for oil companies. The president reiterated his support for rolling back tax breaks for the companies, something critics argue would only increase gas prices. However, the political fallout from rising prices might be limited, according to the latest poll. Most Americans blamed the oil companies, not the Obama administration, for the prices. Republicans in Congress received a similar level of blame to the White House. Fifty-five percent of those surveyed blamed the oil companies a great deal for the recent increase, while 24% said the same of Obama and 21% said the same of Congressional Republicans. Foreign countries that produce oil also received more blame than American politicians of either party. 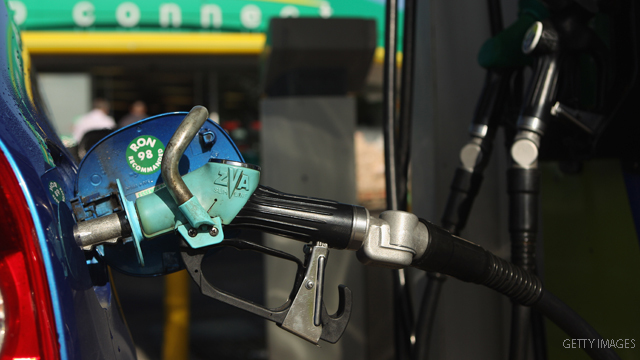 Twenty percent of all Americans said gas prices are the No. 1 economic issue currently facing the country; up from 6% of those surveyed who said the same in December, when gas prices were lower on average. "That 14-point increase is mirrored by the 14-point drop in the number who say that unemployment is the top economic issue, indicating that many Americans who were once concerned about the possibility of losing their jobs are more directly affected by the reality of higher gas prices," CNN Polling Director Keating Holland said. But Americans may not be ready to push the panic button quite yet. Although 71% said higher gas prices have caused hardships for them, only 23% said it was severe enough to jeopardize their current standard of living. Half of those surveyed said gas prices created a moderate hardship that has not yet affected their living situation. The poll, conducted for CNN by ORC International, surveyed 1,014 American adults by telephone between March 24 and March 25 with a sampling error of plus or minus three percentage points. What drives the value of the dollar down? Government debt, interest rate policies and tax policies, none of which take Obama off the hook for the price of gas. You can thank George W. Bush for the path of our budget, whose final fiscal year had a $1.5T deficit. That was Pres. Obama's starting point, and he has brought it down. Don't forget, gas is still not as high as it was in 2008. BTW. You can thank liberals for that 35 mpg car you drive, because conservatives were dead set against those types of government regulations. "And please tell me why, when they are the most profitable ever, the GOP still champions tax breaks for big oil?" Because Big Oil is more rofitable than ever. See how that works? I'm not worried – drive a Camry Hybrd that gets more than 40 mpg on the highway. Big enough to ride smooth, be comfy; small enough to be efficent and easy to park. Subsidies for 101 years? Is that a subsidy or corporate welfare? Once a company is off the ground and makes 30 billion (or 3 bllion) profit, stop the subsidy. "Subsidies for 101 years? Is that a subsidy or corporate welfare?" Neither. It's more like paying tribute to your conquerer.